Anyway, this blog is about the cranberry, which is one of the three "right" answers to that opening stumper. You may have another food that you associate more with holiday home-cooking, but for me, it's the cranberry. Whether it's cranberry bread (delicious), cranberry cake with butter sauce (calorically lethal even if you substitute margarine and 2% milk), or cranberry salad (a Thanksgiving dinner necessity), the lowly cranberry has found a permanent home in my brain's deepest memory banks. 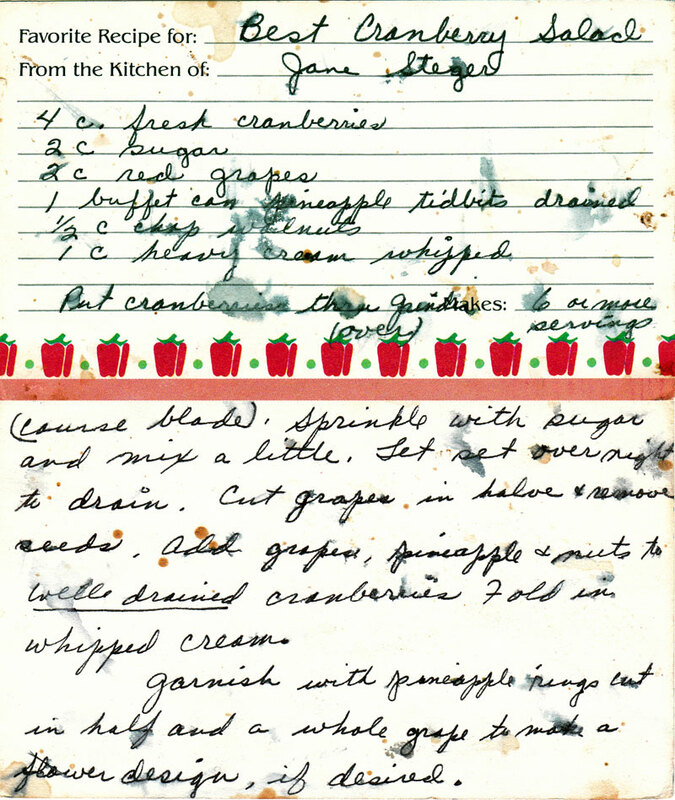 This Thanksgiving I pass on to you, at no cost, my mother's recipe for "Best Cranberry Salad." The name is not hyperbole. Where Mom got the recipe is lost in history. She thinks it came out of a newspaper or magazine. Google turns up similar recipes with the very same name so she may be right. 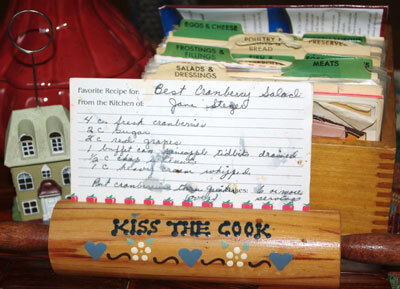 She is sure it wasn't handed down from her mother or mother-in-law and she's sure she didn't just make it up herself, so there may be someone out there deserving of original credit, but as Mom has been making "Best Cranberry Salad" for over a half century, she's pretty deserving of credit herself. In any case, click on the photo above for the recipe, make it this Thanksgiving at your house, and just see if it isn't the "Best Cranberry Salad" you've ever eaten. A half century from now, your own kids will thank you for it. P.S. You can always tell a good recipe. It's the one with the food stains and smears on the recipe card, indicating long and heavy usage. This one qualifies.